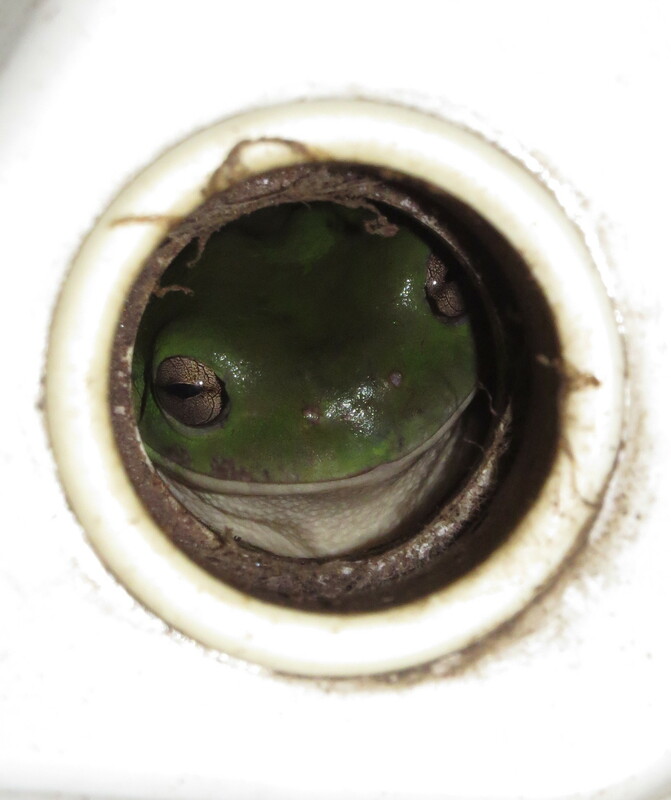 This Common Green Tree-frog (Litoria caerulea) spent the long dry spell in the overflow of an outdoor basin, quite safe from a butcherbird’s beak or a snake’s gaping jaws. 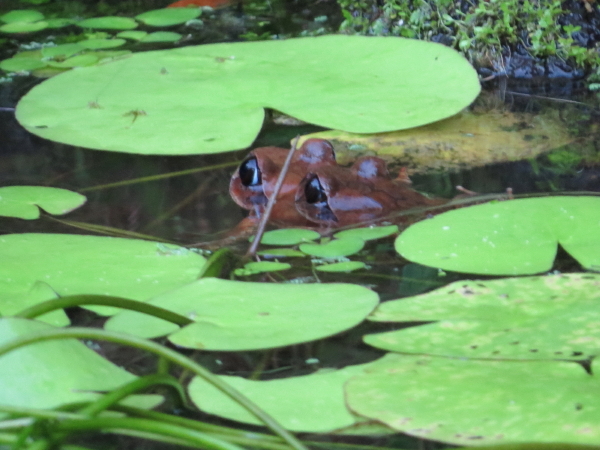 After the first substantial showers, our pond hosted several frog orgies. This pair of Barred Frogs (Mixophyes coggeri) was still active after sunrise. 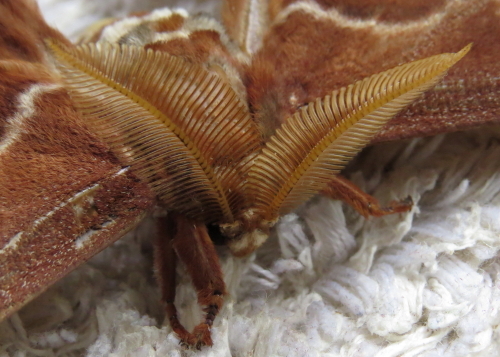 The female was keen to get rid of the male, telling him with several deep, short grunts to release his grip on her . This is the only occasion when one hears female frogs calling. 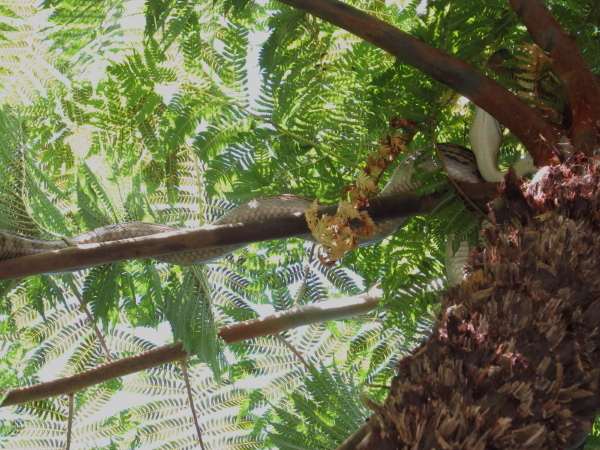 She was probably keen to seek shelter for the day, and rightly so: this large Keelback entered the pond just moments later. 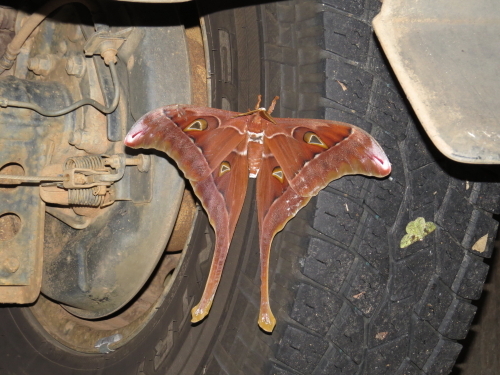 When I saw it emerge from the water and disappear into the forest, it did not sport a big bulging belly! 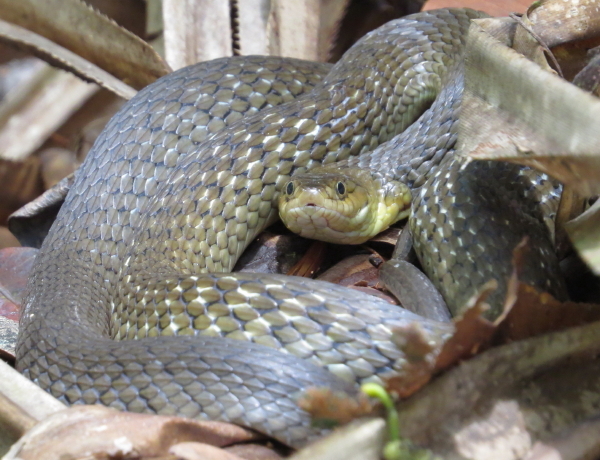 The Keelback (Tropidonophis mairii) is the only Australian snake which can eat the toxic cane toads without ill effect. 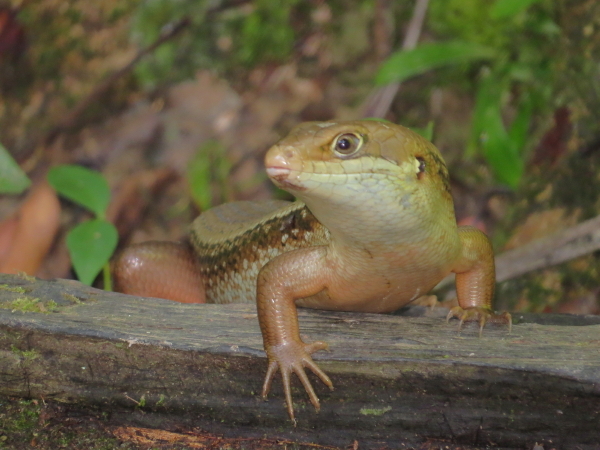 Its ancestry lies in Asia, where snakes had a long time to adapt to poisonous toads. 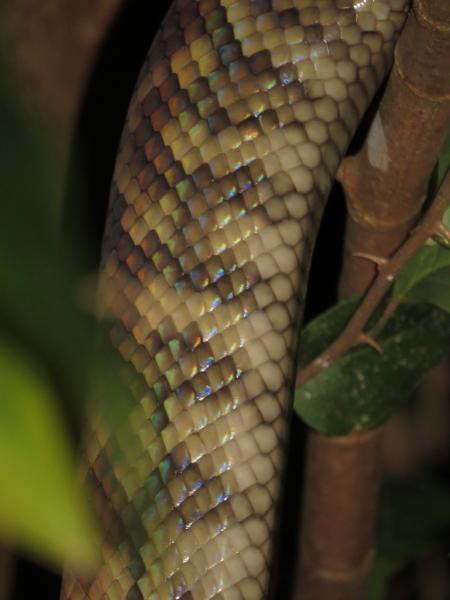 Named for its strongly keeled scales, which give it a “rough”-looking skin, it is easy to identify. 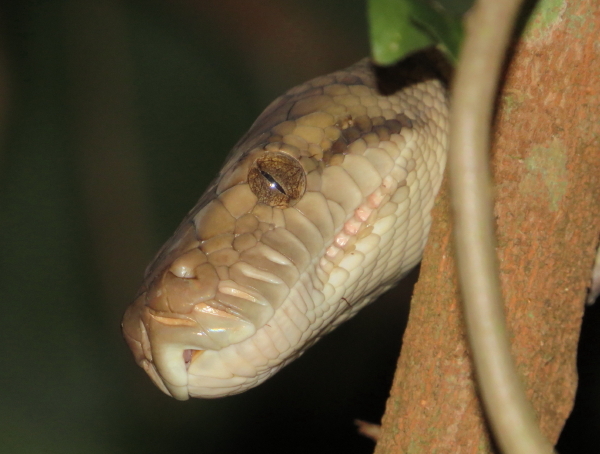 The only other snake, which looks similar is the highly venomous Rough-scaled snake (Tropidechis carinatus), which fortunately lives at higher altitudes in North Queensland, and not around Kuranda. 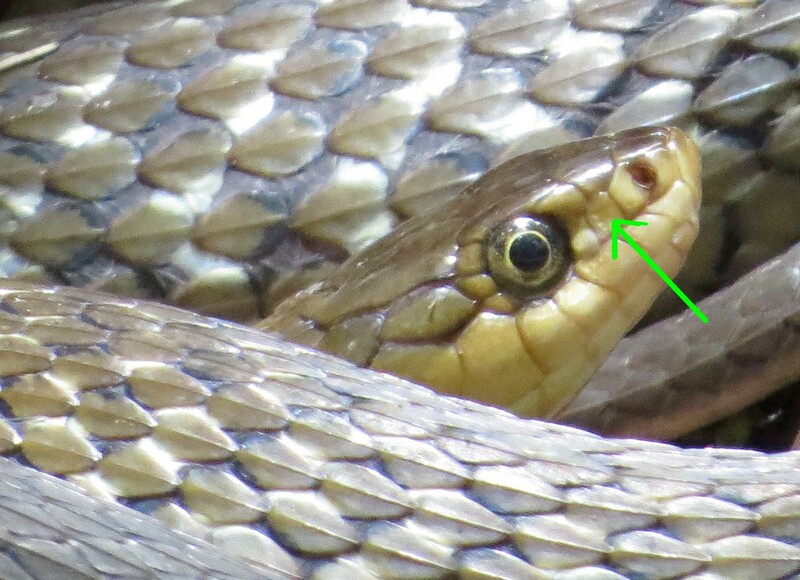 You can tell them apart by having a close look at the scales between their eyes and nostrils (preferably by taking a photo and zooming in, rather than approaching the snake too closely!). 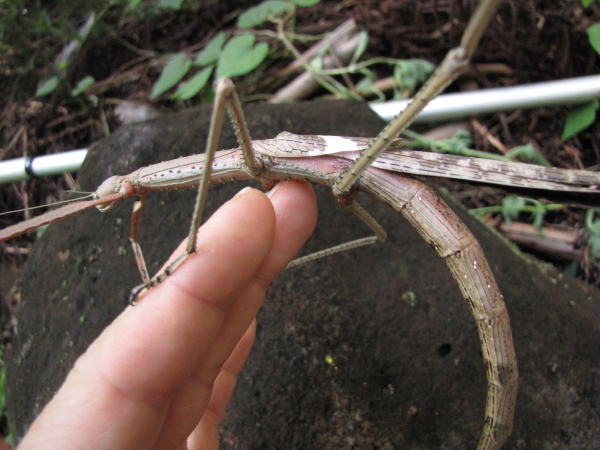 With the recent advent of rain we have seen an abundance of insects (many stick insects !). 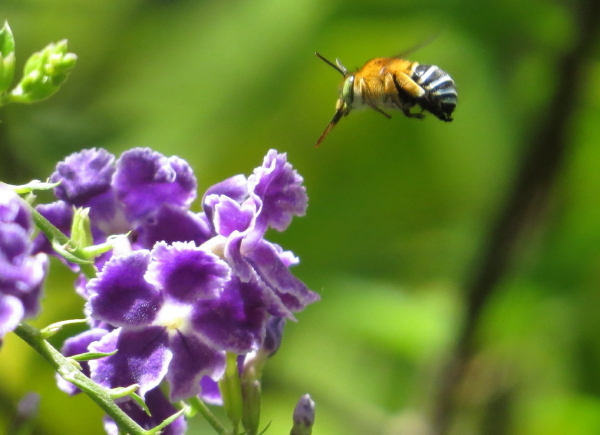 If you are interested in native bees, you’ll find many photos and descriptions under the native bee project at http://www.bowerbird.org. 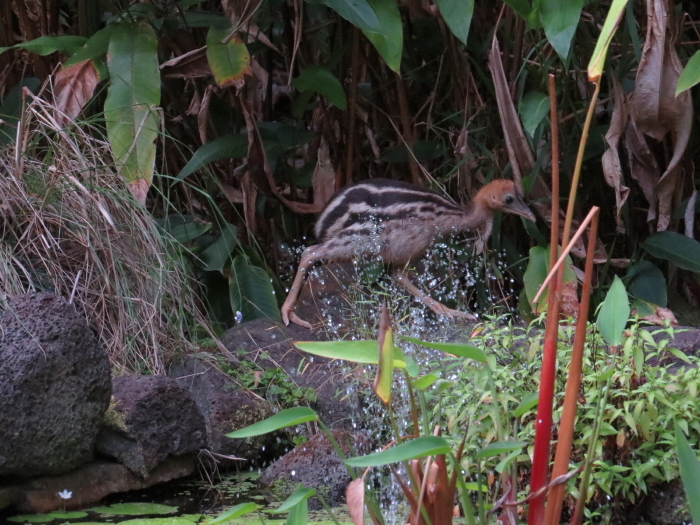 The one remaining cassowary chick ( see last blog), was not seen again from mid-November 2014. 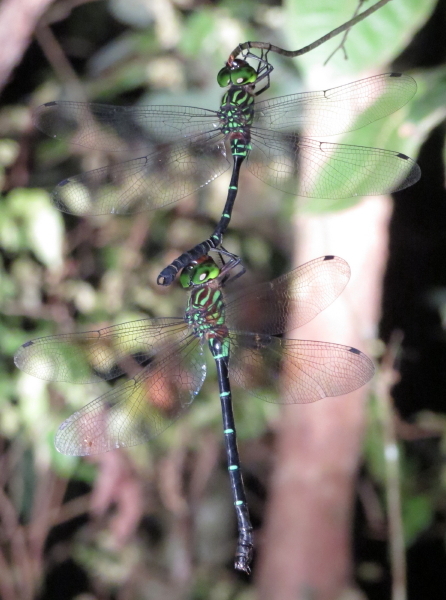 The female (“Missy”) initiated mating almost immediately. 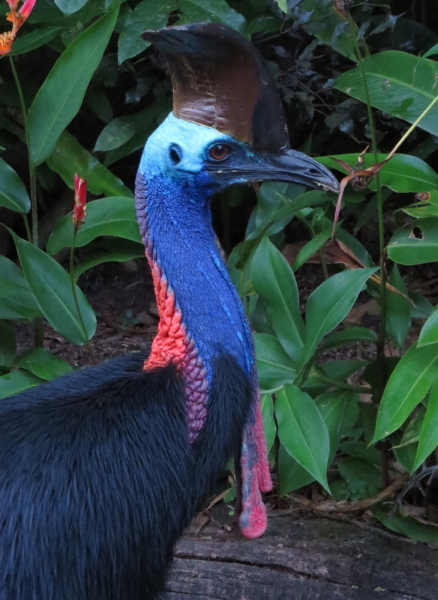 Male and female cassowaries visited us jointly a few times in December, January and early February. 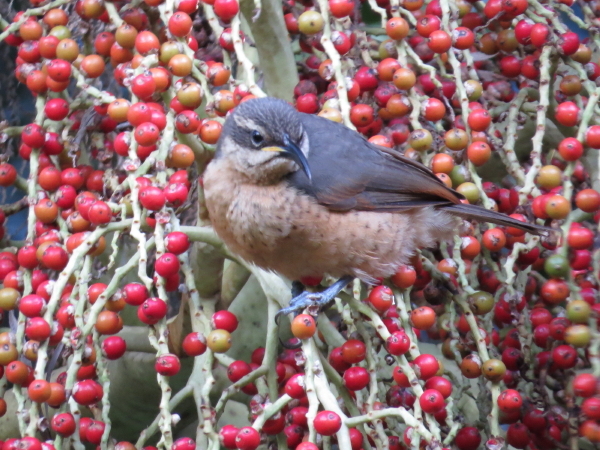 There were fewer, compared to previous years, visits by the male. We do not know whether he is sitting on eggs, visiting us in his spare time (this would be unusual), or taking a sabbatical. 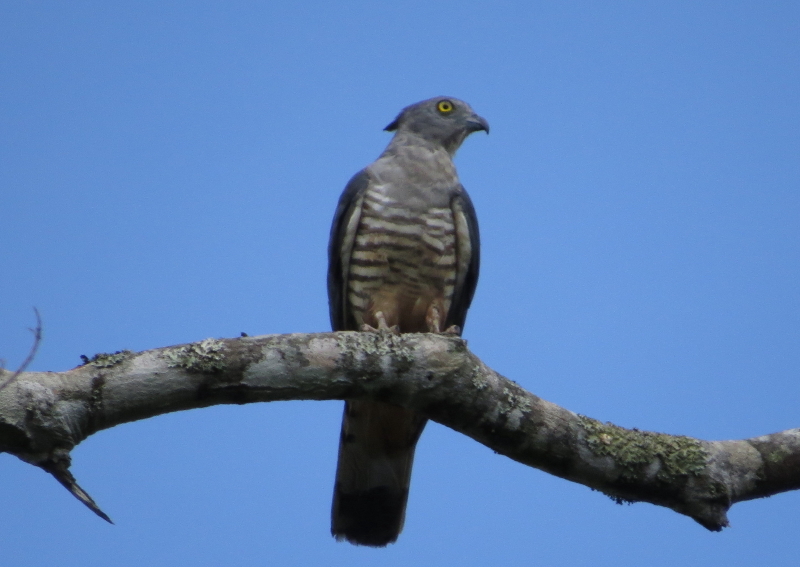 By early January most of the daily-visiting Chestnut breasted Mannikins (Lonchura castaneothorax) had left. 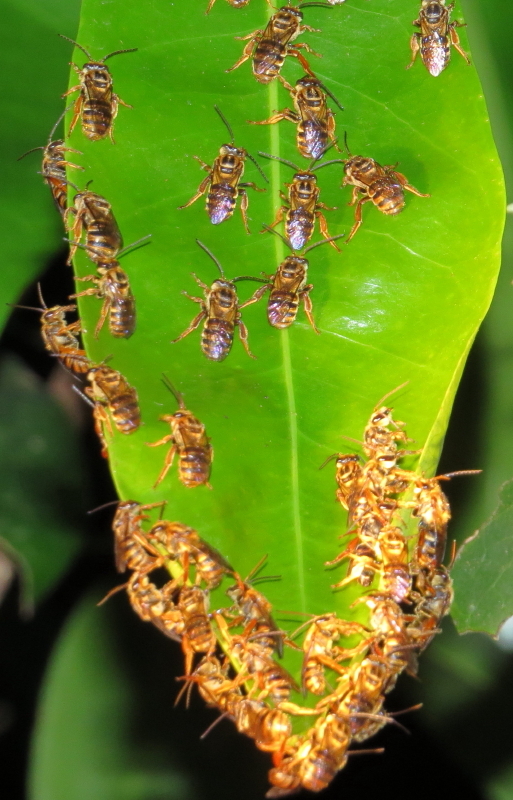 For many species this is the breeding season. 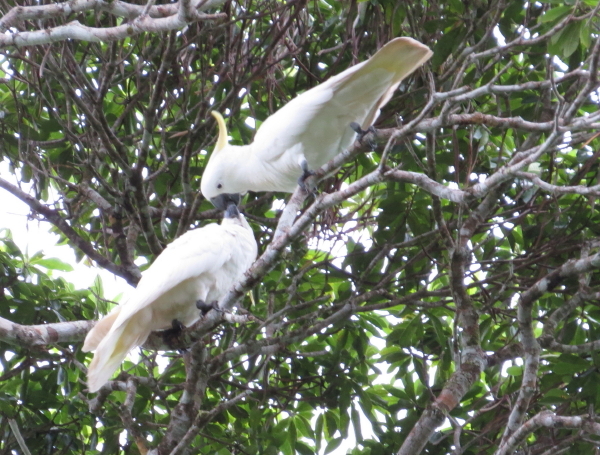 In the case of birds it means they are more vocal/territorial. 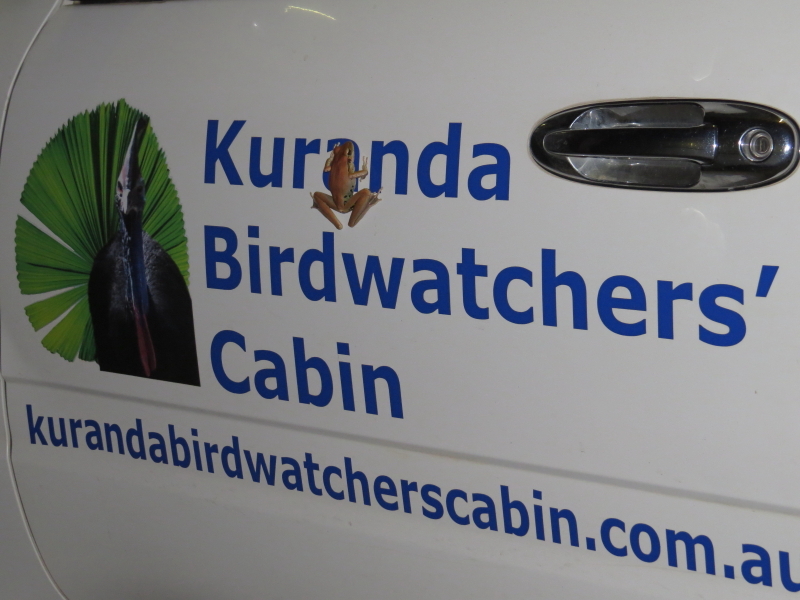 This helped in observing Yellow-breasted Boatbills (Machaerirhynchus flaviventer) on our property, they have a distinctive call. Pacific Bazas (Aviceda subcristata), too, have a very characteristic call, and they have been very noisy around our place recently, flying through or just above the canopy and snatching katydids and other juicy insects from the foliage, which they then ate leisurely. Again the Sunbirds (Nectarinia jugularis) had a very hard time producing offspring: the Butcherbirds (Craticus quoyi) destroyed two nests with eggs, which were not consumed. Anecdotal evidence around our house: fewer than one in four attempts to raise chicks has been successful . 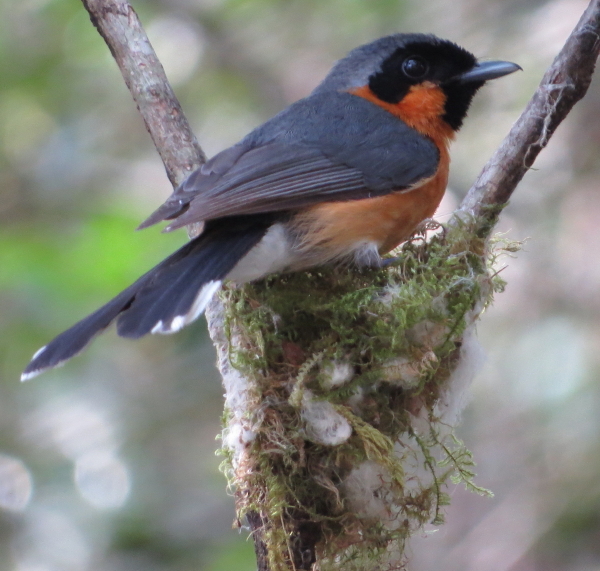 The Spectacled Monarch flycatcher (Monarcha trivirgatus) have more success, although their nest sites appear to be quite exposed to aerial predators. 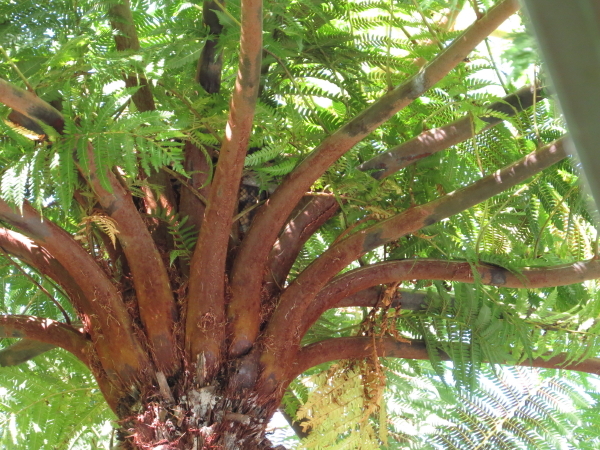 All the nests, which we have found so far, were neat cups, located in the fork of a small tree, just 2-3m off the ground. 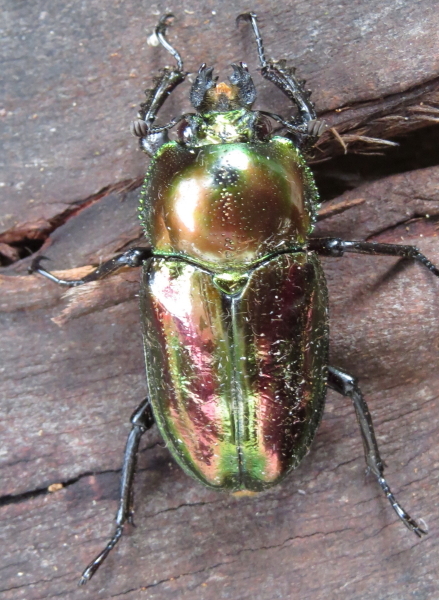 Until early February North Queensland, including the rainforest areas, was in drought and considerably too hot. 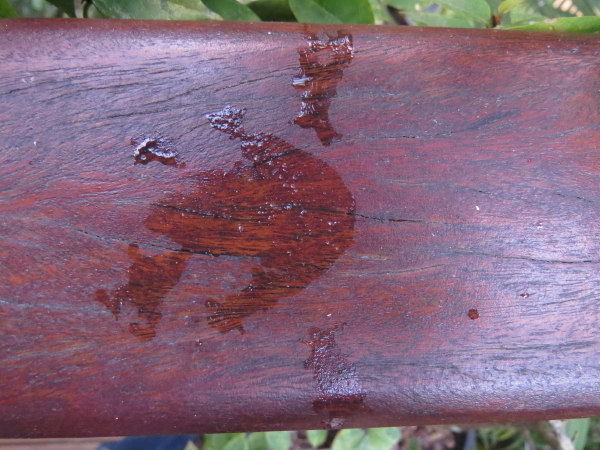 Flora and fauna showed signs of heatstress. 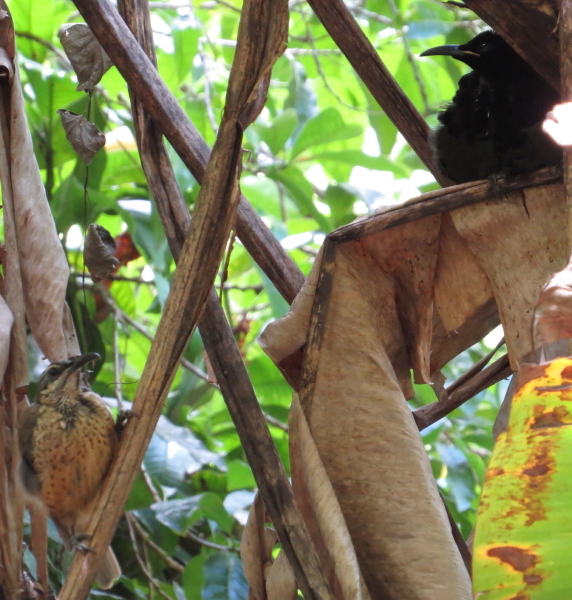 This pair of Victoria’s Riflebirds (Ptilotis victoriae), was hanging out in a shady spot for almost half an hour – giving me plenty of time to fetch my camera. 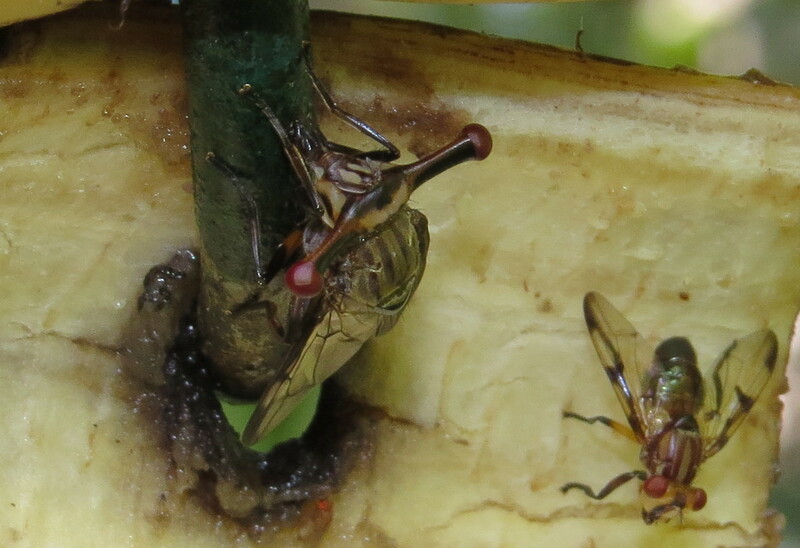 A Red-leafed Fig (Ficus congesta), which we planted near the cabin a few years ago, is fruiting several times a year, and not only attracts Double-eyed Fig Parrots (Cyclopsitta diophthalma) . We also observed two Blossom Bats (Syconycteris australis) and one Tube-nosed Bat (Nyctimene robinsoni) feasting on figs in December. 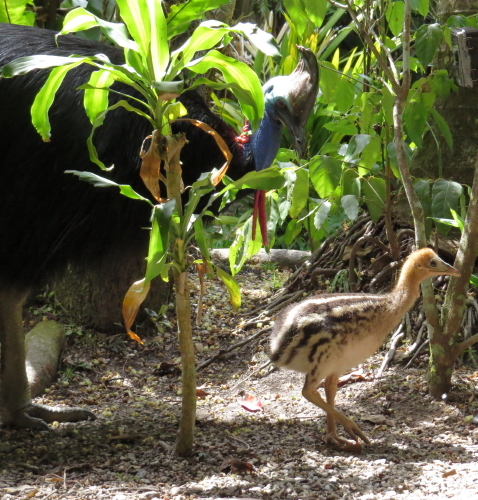 Mr Cassowary (“Dad”) has returned with a new chick (he had two this year, but the other one succumbed to a leg injury). 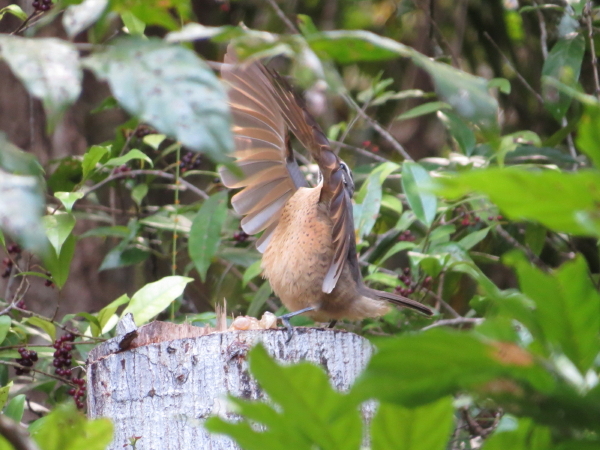 A large tree was snapped off during the cyclone in April , and we decided to cut off the splintered top of the stump, in the hope that the smoother surface might entice a Victoria’s Riflebird (Ptiloris victoriae) to use it as a dance floor for his courtship display. Another legacy of the cyclone are a lot of broken branches and tree trunks, which we gathered in a large pile in the forest at our garden’s edge. 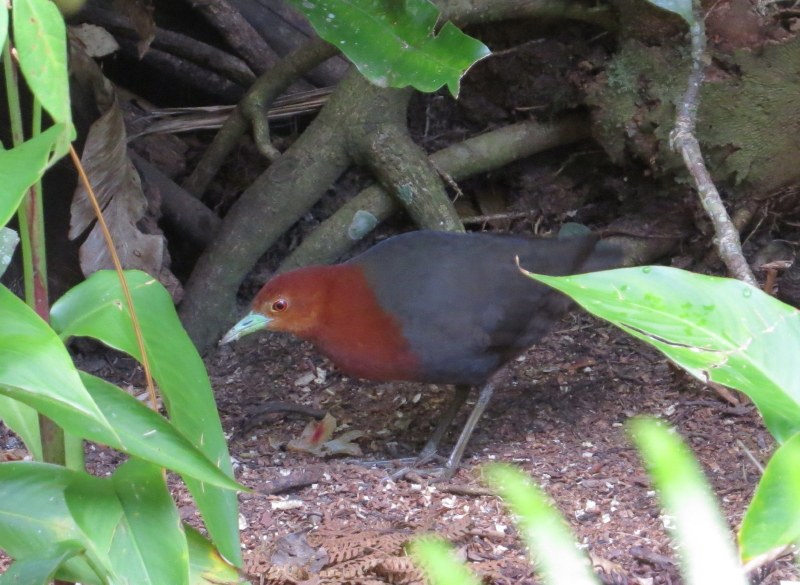 It now houses a couple of Red-necked Crakes (Rallina tricolor), who emerge regularly to forage for insects and worms. 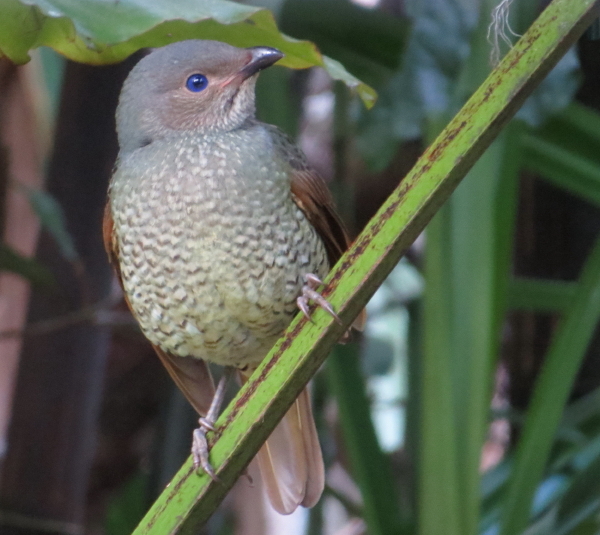 Many birds are starting to mate and build nests, Pacific Bazas (Aviceda subcristata) and Wompoo Fruit-doves (Ptilinopus magnificus) are especially vocal. 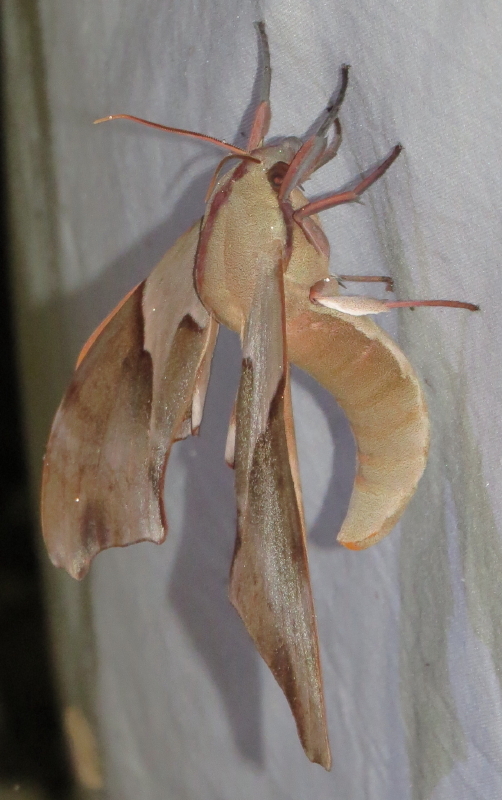 It has been very dry , but as Dad has only one chick to raise this year, finding enough food should not be a problem. 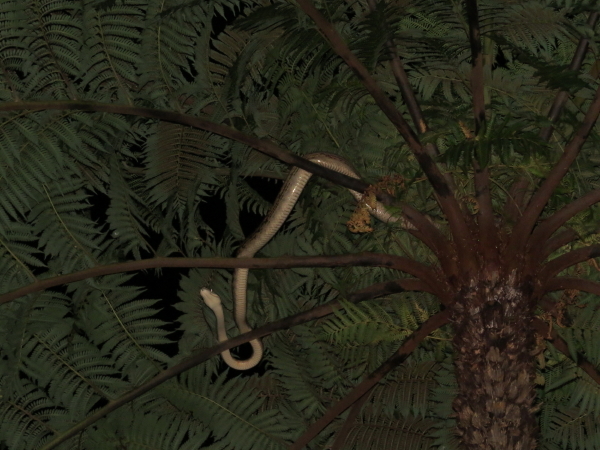 We found our first Pygmy-possum while spotlighting last week. There are 5 species of those very small (about 10cm head-body length) possums in Australia. 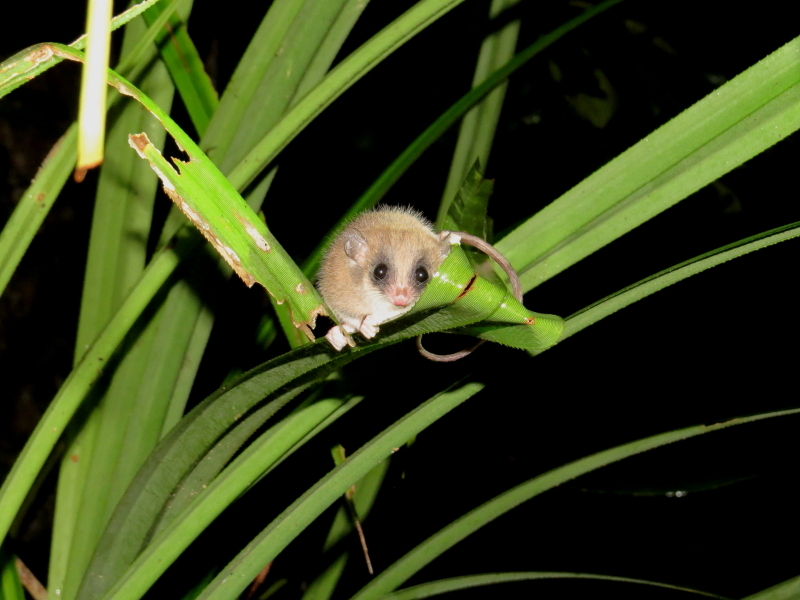 Here in the tropical rainforest of North Queensland we have the Long-tailed Pygmy-possum ( Cercartetus caudatus). 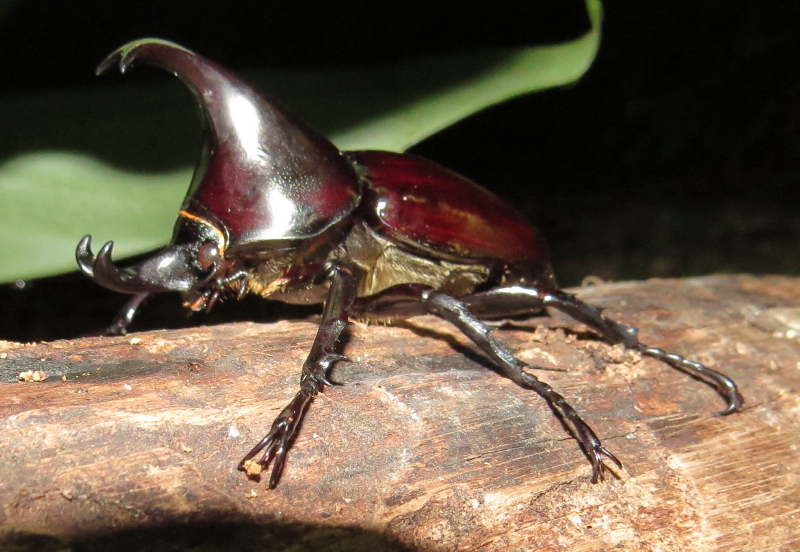 They are quite common in their restricted habitat, but not often seen, due to their minute size and arboreal habits. 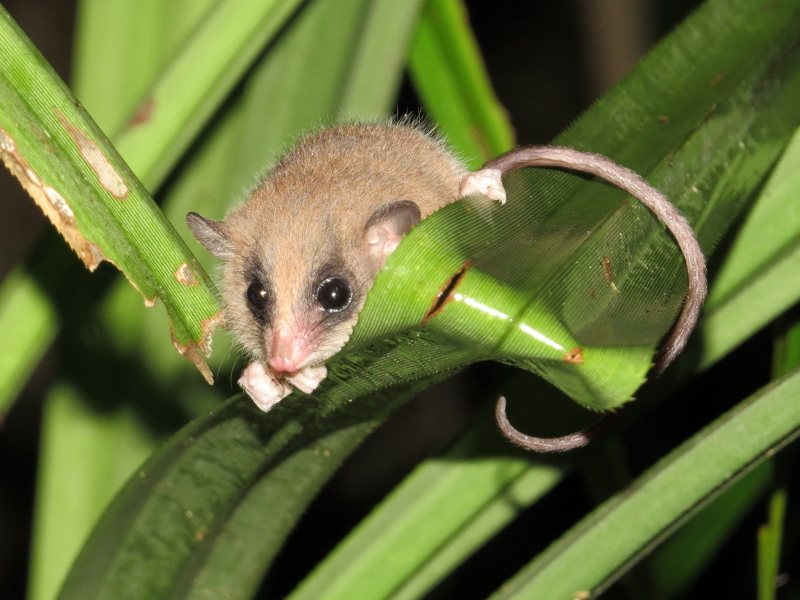 The superficially similar Tree Mouse (Pogonomys sp. 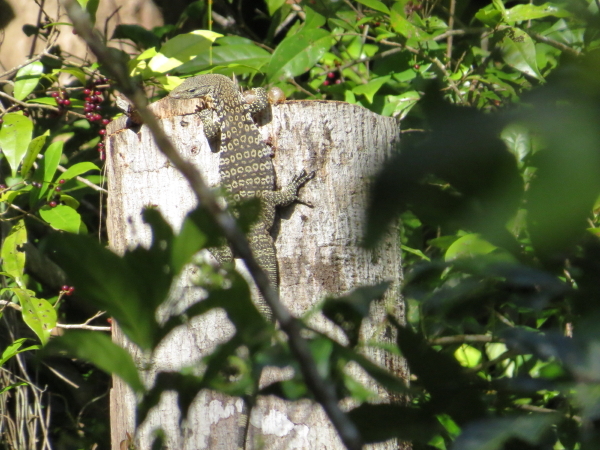 ), a rodent, also lives here, but they are very flighty, when discovered, and we have not been able to get a good photo of one, yet.